I was a busy crafter this past week making year-end gifts for teachers. My son only has one teacher but my daughter has several ladies who work in her playschool room so I made several necklaces. Here they all are hanging on the blue spruce in my yard. This tree of life was one I made for my Mom's Birthday and blogged about it at the bottom of this post. This is the bird's nest pendant necklace I made for my son's Grade 2 teacher. She had the kids make these for all the Moms for Mother's day so I think it's fun to make one for her. I also made her a notebook and pen set that I wrote about here. I learned to make the bird's nests from The Frugal Crafter as well from this tutorial. On another day this week I made all the little packages for these necklaces. Here are some photos of what I did. I found this gift box template on the Internet here. I printed it and cut it out. Then I traced it onto card stock. I put the printed template on top of the wrong side of the paper and scored along the fold lines with my Score Pal from Stampin Up. If you do not have a Score Pal you can use the scoring blade that comes with your paper trimmer or you can use a bone folder or stylus and just trace the lines. Then I flipped it over and stamped all over the paper to decorate it with little tiny images. Then I folded along all the scored fold line and glued down the four tabs with glue dots They are much less messy than glue and they hold really well. 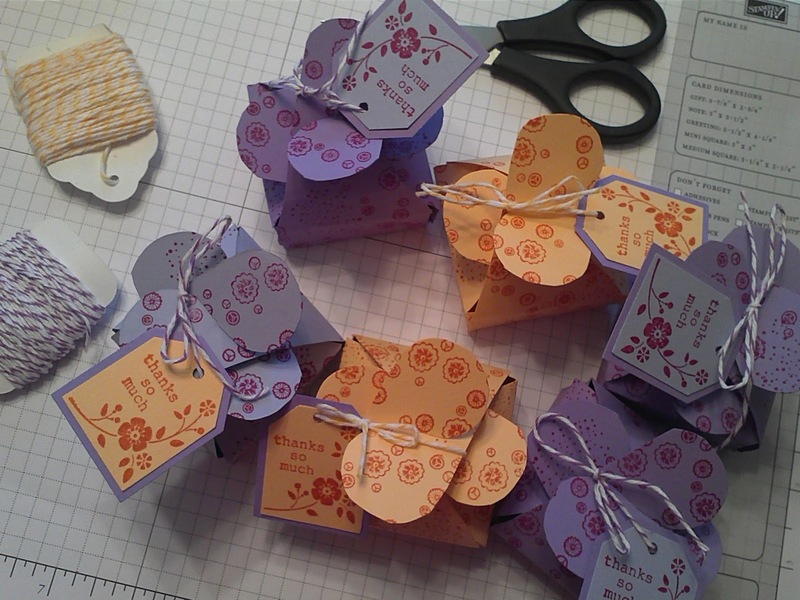 Then I put the little gifts inside and hooked the tops of the box together. I tied the tags on with matching baker's twine. And voila! If you've read this far you totally rock! Thank you so much for stopping by and reading my post about my teacher gifts. You gotta love teachers! Linking up with Crafty Girl Linky Party on Friday. The button is on the button bar ----> waaaayyy up near the top!